In my house I do grilled chicken on busy day in Aussie style (just put chicken and grill it). 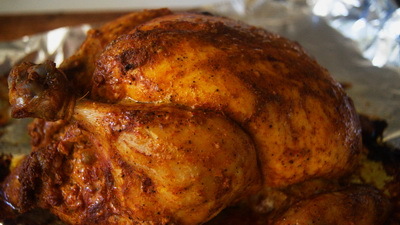 But when I tried Bangladeshi style grilled chicken, my daughter said that we should do that more often. Trust me that she knows the taste very well. 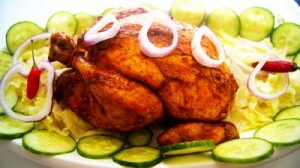 So enjoy the spicy Bangladeshi style grilled chicken. 1. Clean chicken and wash it and pat dry chicken well. 2. 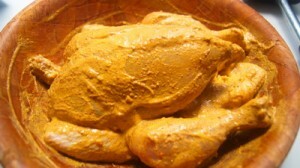 Marinate chicken with all ingredients except butter. Mix well inside and outside. 3. Let it marinate for at least 8 hrs but don’t do more than 36 hours. 4. Preheat the oven on 180˚c. 5. 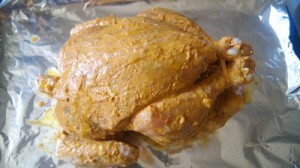 Brush butter on chicken, tie the legs and twist the wings in back. 6. Place chicken over aluminium foil and bake it for 65-75 minutes. 7. Take out the Grilled chicken from oven and cover with aluminium foil for 10 minutes. 8. Serve hot Grilled Chicken with your favourite salad. Thanks for invitation. May be next year. See ya.. I read some of your recipie. Its really easy prosedure. Thank you. Hi there! Thank you for the wonderful recipes :)! They are very detailed and through, love following your blog. I have a question, which Chat masala do you use? I used some brands which I didn’t like, so I try to skip it in my recipes. Can you please refer me the one that you use? Thanks! বাংলায় কী যায় না বলা?! Hi there I don’t have papaw paste can it be excluded from the recipe. By the way love all the recipes have read so far. Keep up your good work and thanks very much.